Talks will be held at the level of foreign policy advisers with participation of Ukraine's foreign minister. Ukrainian President Petro Poroshenko and the leaders of G5, including the UK, Great Britain, Germany, France and Italy have agreed to develop a roadmap for the implementation of the Minsk agreements, he told journalists following the talks. "We have thoroughly elaborated mechanisms of coordination of our efforts on ensuring coordinated actions in the implementation of the undertaken commitments by Russia," he said. Poroshenko noted that the final document of the Ukraine-NATO Commissionclearly stated that the political part of the Minsk agreements, including holding of local elections, can be implemented solely after the creation of necessary security conditions. This position was included in all NATO documents and was confirmed in the course of the G5+Ukraine meeting. According to the [resident, it was agreed that consultations of foreign policy advisers with participation of Foreign Minister Pavlo Klimkin on the elaboration of the so-called road map on the security component will start shortly. In the framework of the given meeting, Ukraine is planning to discuss the security component and fulfillment of positions on sustainable cease-fire, guaranteed withdrawal of equipment and artillery, liberation of hostages and unhindered access to the entire occupied territory for the OSCE SMM, including the uncontrolled area of the Ukraine-Russia border. "Our delegation is grateful to our partners and allies for their position. All tasks for the NATO Summit have been fulfilled," Poroshenko said. According to the president, the two-day NATO summit was held in intensive schedule. The president held 18 meetings in bilateral and multilateral format. 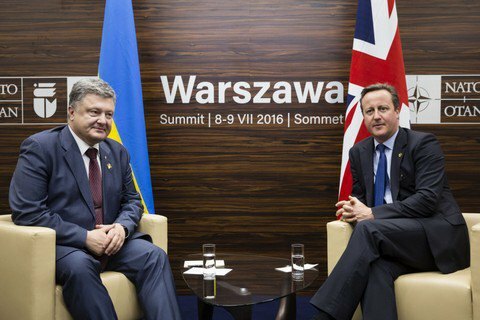 According to the head of state, Ukraine remains a top-priority partner of the alliance. In the course of the Ukraine-NATO Commission, the majority of NATO members expressed support for Ukraine in the implementation of the Minsk agreements, liberation of Ukrainian territories from the Russian aggression in Donbas and Crimea and development of the defence and security sector of Ukraine. According to the president, it goes about the financial expert and political support of NATO. "The results achieved open great prospects for us," he emphasized.